Ten of Korea’s top scientists, including chemist Kim Ki-moon from POSTECH and biologist Kim V. Narry from Seoul National University, have been named to lead the state-run research center for basic sciences. The Institute for Basic Science announced the list of its directors after four months of assessment. The IBS was established in Daejeon in 2011, as a part of the government’s 5.2 trillion won science belt project, with the aim of developing human resources through basic scientific research. A total of 101 scholars and researchers applied for the directorial positions at the newly established science institute. The IBS set up an evaluation committee and studied the applicants over the past four months to select the best qualified candidates. The 10 directors, including three overseas Koreans, are world-renowned scientists in various fields of basic science, the IBS said. The 58-year-old Kim of POSTEC is considered one of the world’s finest researchers in chemistry, and has won numerous awards, including the country’s Best Scientists and Engineer Award. In 2010, he drew international attention by isolating a membrane protein using a new technique. SNU professor Kim, 43, has published papers that were published in a number of authoritative scientific journals such as Nature in the last 10 years. 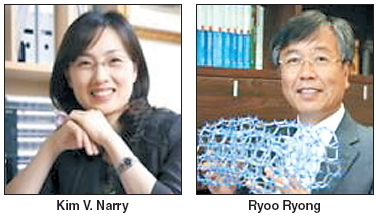 Other newly appointed directors include: SNU professor Hyeon Taeg-hwan, Kim Eun-joon of Korea Advanced Institute of Science and Technology, Noh Tae-won of SNU, Shin Hee-Sup of Korea Institute of Science and Technology, Cheong Sang-wook, director of Rutgers Center for Emergent Materials, Ryoo Ryong of KAIST, Charles Surh of POSTECH and Oh Yong-geun of University of Wisconsin-Madison. The IBS is planning to appoint 15 more directors within this year and to appoint a total of 50 research directors by 2017.